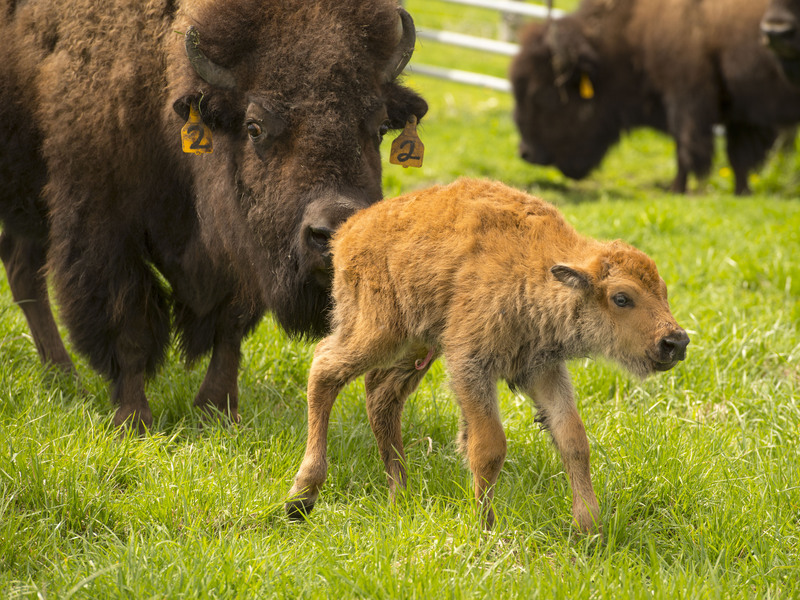 VIDEO STORY: New Bison Baby Born at Fermilab! Browse: Home / 2017 / April / VIDEO STORY: New Bison Baby Born at Fermilab! Late April is always a special time of year at Fermilab. Spring is in the air, the leaves are green, the birds are singing, and adorable baby bison are born. Baby bison season is here, and all are welcome to visit with and photograph the newborns. (They’re always a hit with young children.) Fermilab is expecting the new babies to be joined by at least 10 more over the next six weeks. The site is open every day from 8 a.m. to 8 p.m., and admission is free. You’ll need a valid photo ID to enter the site. Fermilab’s first director, Robert Wilson, established the bison herd in 1969 as a symbol of the history of the Midwestern prairie and the laboratory’s pioneering research at the frontiers of particle physics. The herd remains a major attraction for families and wildlife enthusiasts. And thanks to the science of genetic testing, Fermilab’s ecologist Ryan Campbell confirmed that the laboratory’s herd is 100 percent bison, with no cattle genes. Farmers during the early settlement era would breed bison with other bovine species to keep them from extinction, but Fermilab’s bison are purebred. A herd of pure bison is a natural fit for a prairie ecosystem, like the kind that exists on the Fermilab site. Fermilab hosts 1,100 acres of reconstructed tall-grass prairie. While you’re at the Fermilab site visiting the bison, you can learn more about our ecological efforts by hiking the Interpretive Prairie Trail, a half-mile-long trail located near the Pine Street entrance in Batavia. The Lederman Science Center also offers exhibits on the prairie and hands-on physics displays. The Lederman Center hours are Monday-Friday from 8:30 a.m. to 4:30 p.m. and Saturdays from 9 a.m. to 3 p.m. And the 15th floor of Wilson Hall is open to the public from 8 a.m. to 4:30 p.m. Monday through Friday and from 9 a.m. to 3 p.m. Saturdays and Sundays. For up-to-date information for visitors, please visit www.fnal.gov or call 630-840-3351. To learn more about Fermilab’s bison herd, please visit the wildlife area of Fermilab’s website. Fermilab is America’s premier national laboratory for particle physics research. A U.S. Department of Energy Office of Science laboratory, Fermilab is located near Chicago, Illinois, and operated under contract by the Fermi Research Alliance LLC. Visit Fermilab’s website at http://www.fnal.gov and follow us on Twitter @Fermilab.